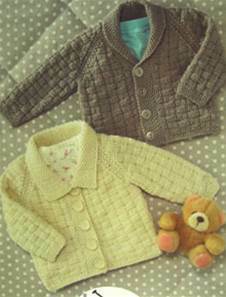 Jacket: 41-51cm 100g, 56-61cm 150g, 66cm 200g. Baby DK yarn, 22st/ 32 rows to 10cm over pattern, 4mm needles.3.25mm and 4mm needles. Yarn suggestion: any baby DK. For similar brown try Sirdar Snuggly DK Smudge.